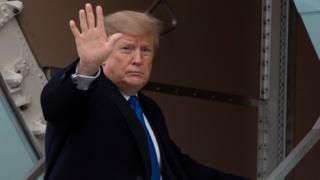 US President Donald Trump will try to apply further pressure to Venezuela’s military during a speech on Monday. In Florida, Mr Trump is expected to say the US “knows where military officials and their families have money hidden throughout the world”. The speech represents a further attempt to persuade them to switch allegiance to opposition leader Juan Guaidó. The US has already implemented other economic sanctions after President Nicolás Maduro refused to step down. The head of the country’s opposition-led National Assembly declared himself as such during an anti-government protest last month. Mr Maduro has criticised outside influence in the country’s internal affairs. He has also maintained the support of his military and several key allies. What will Mr Trump say? According to excerpts from the speech released by the White House, Mr Trump will try to appeal to individuals within the military directly, saying they should “work toward democracy for their future and the future of their families” or “they will lose everything they have”. He is also expected to say Venezuela should not be a “puppet state” of Cuba – one of the country’s strongest regional allies. 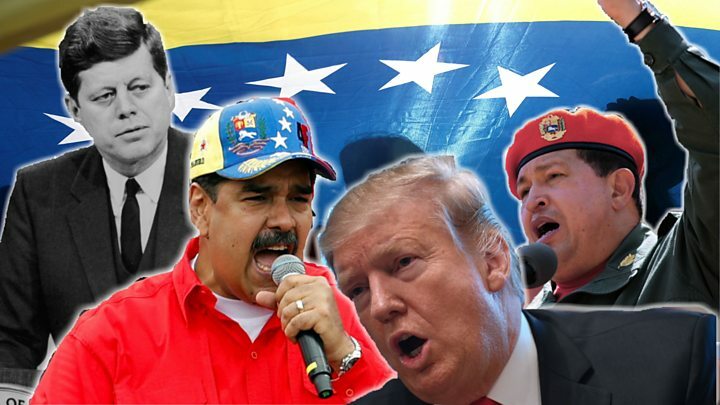 Mr Trump will also reiterate his strong support of Mr Guaidó during the address – which he will give from Miami’s Florida International University. South Florida has the greatest concentration of Venezuelans living in the US. Tens of thousands of expatriates live in the Miami area, many of whom fled Mr Maduro and his predecessor, and support for Mr Guaidó is strong. Mr Trump has said “all options” are on the table in regards to Venezuela. US economic sanctions are putting pressure on Mr Maduro while tension continues over international aid collections organised by Mr Guaidó. A bridge between the two countries is currently being blocked by shipping containers – and is not clear if President Maduro will allow it to enter. Another collection has started in Brazil, and A third is expected on the Dutch island of Curacao off Venezuela’s north coast. Mr Guaidó has said 600,000 volunteers have already signed up to help carry the aid into the country on 23 February – the deadline he has set. On Monday, Venezuelan opposition officials criticised the state internet provider for blocking the website that allowed volunteers to sign up, AFP news agency reports. Mr Trump is also expected to ask the military to facilitate the aid’s entry during Monday’s speech. Despite dozens of countries now backing the opposition, Mr Maduro has so far kept the support of his military. He has also retained the support of key allies who have helped bankroll the country’s economy, including Russia and China.